In personal news, I recently published my trilogy of fantasy novels in a single paperback volume. 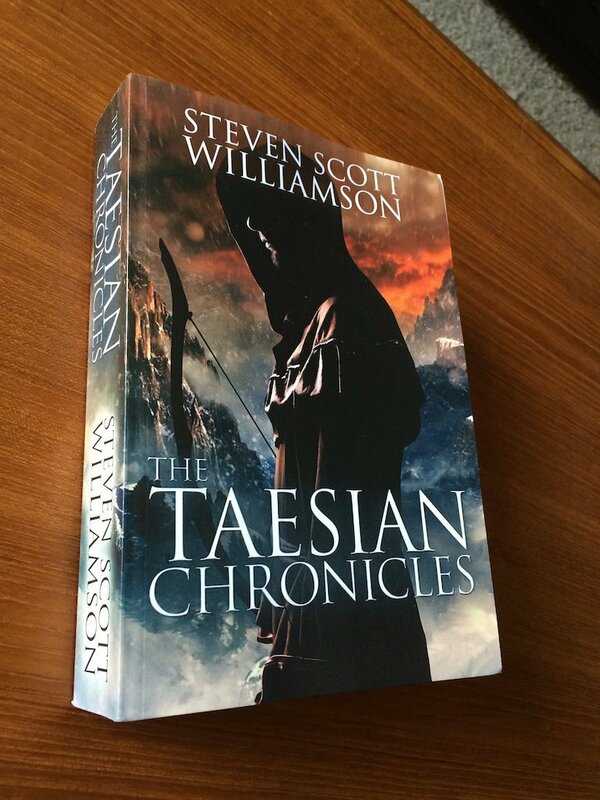 It is entitled The Taesian Chronicles and is available for sale from Amazon.com or directly from me if you want an autographed copy. In other news, I just put a new set of Shinko 011-Verge tires on my 2012 Suzuki GSX-R750. I got a little over 6,000 miles on the previous set. Their chicken strips were less than 1/4″ wide and the wear pattern was very uniform and round; no squared-off center strip at all. I am very impressed with the Shinko’s. As the previous set lost tread, their traction degraded gradually. I backed it into a few corners and was impressed with how gracefully it happened. There were no sudden losses of traction or pucker moments. I’ve had several fast runs to Detroit lately, and have really upped my riding game. I still have a ways to go, however, and am always working to improve my skills. Over the holiday weekend I rode each of my bikes to Detroit and back, the V-Strom on Friday and the Gixxer on Saturday. There were a lot of vehicles on the road and a fair number of bikes as well, and Detroit itself was hopping. Something interesting happened. I gassed up my V-Strom on regular unleaded at the small store in Detroit on Friday and paid $8.90 for the fuel bill. On Saturday I rode my Gixxer to Detroit and filled up the tank on premium unleaded. The bill? I recently got divorced and part of that process involved moving out of my house in the suburbs and into an apartment in the city. It also meant storing my two bikes — 2007 Suzuki V-Strom 650 and 2012 Suzuki GSX-R750 — in a storage unit since my apartment complex had no garages available. It’s somewhat of a pain having to drive a half mile just to get to where my bikes are located, as you can imagine. But, at least I still have them. This past weekend I needed to get some time on two wheels and decided to take my Gixxer for an overnight trip to John Day in central Oregon. The route I take passes through some of the finest geography in the west and courses over some incredible riding roads. I’m leery of giving too many details because I don’t want to get the word out. Before you know it, the route is crawling with motorcycles and the resultant law enforcement like remoras attached to sharks. The weather was perfect, the road conditions were nearly flawless, and my Gixxer was running like an Olympic athlete. It was a wonderful trip. I stayed at the Best Western John Day Inn and ran into three grey-haired gentlemen from Canada that were immediately familiar to me. We met in the same place a few years earlier as they were coming down from British Columbia to enjoy the roads in Oregon. Two rode BMW’s and one rode a Yamaha FJR1300. The first time I met them, I was on my filthy and road-weary V-Strom on my way back from a very long trip. This time we chatted about my Gixxer. It is fascinating that we should meet up in the same location a second time, so many miles (or kilometers) from home. They are really nice guys and I regret not getting their contact information. As I left Sunday morning I jokingly said, “I’ll see you again in a couple of years.” It just may happen. I’ve been wearing an Aerostich Darien jacket for over 60,000 miles now, and if you’ve read any of my previous blog posts on the topic, you’ll quickly learn I value it more than any other single piece of gear I own. It’s about to have company. This morning I ordered a Roadcrafter one-piece suit from Aerostich, to be worn predominately while riding my 2012 Suzuki GSX-R750. The color scheme I chose was a black suit with blue ballistic accents. A few weeks ago I spoke with a sales rep at Aerostich on the phone. He convinced me to try on a standard off-the-rack sized Roadcrafter first and ship it back before ordering a custom-made version. The idea is, you put on the standard model, get on your bike and see what adjustments would need to be made. It takes a bit more time, but the suit will be custom-made just for me and I plan to put tens-of-thousands of miles on it, so fit matters. I’m glad I did. Aerostich shipped a Roadcrafter Light with upgraded pads to me. I tried it on, then sat on my Gixxer while it was up on the paddock stand. Once I got into my tucked riding position, I quickly realized the arms need to be rotated forward slightly. All other aspects of the fit were fine. I called Aerostich and placed my order for the custom Roadcrafter, then I boxed up the Light and dropped it off at UPS on my way into work. Most Roadcrafters take 8-10 weeks to make and ship, but fortunately the wonderful folks at Aerostich back-dated my request to my first call back in May. I should hopefully see my new suit within the next 7-8 weeks. I’ll report more when it arrives. Saturday I pulled both bikes out into the driveway. It was chilly, in the low 30’s, but the sun was shining. I gave the chains on each bike a thorough cleaning, then added fresh lubrication. I ran the engines for 10 minutes, and using the center stand on the V-Strom and the paddock stand for the Gixxer, was able to run the bike in gear. I rode my V-Strom to work last week so it received it’s once-a-week maintenance ride, but my Gixxer hadn’t received any forward momentum love. I decided to suit up and zip into Gresham and back on the sport bike. It was good to get it out onto the road, although anywhere shade crossed the pavement I encountered a frosty road surface. Those kind of rides require a mellow throttle and brake application.